The Incoherent Ramblings of a Stay at Home Mom: Wordless Wednesday. 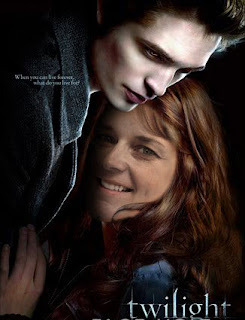 I haven't done a WW in a while and this has been hanging around my inbox since my birthday, I stare at it almost everyday, it's a little something my Aunt JuJu and cousin F. put together for me... And yes, the Twilight addiction is still in full swing. Duh! I guess I just made this a wordFULL Wednesday, eh? I just finished Twilight a little over a week ago and I can't wait to get my hands on New Moon! Although I must say, I am a little jealous. Your blog has touched my life therefore I've decided to award you! Please see my post today! What do you think of Dakota as Jane? I think YES. Umm..what are you doing with my bf? Awww, your cousin F squealed when she saw this. You two look good together, but your hubby still has him beat.